Junior Sarah Fall '18 wants to see things change from the inside out. Cities, institutions and people — they all need an altruistic core if they're going to serve a diverse population. "I want to see cities built in a way that's socially and environmentally responsible," Fall said. "I think there's an opportunity to dig deeper than economic developers usually dig, to where there's no longer a ‘poor' and ‘rich' side of town." When she first arrived on campus at CSS, Fall said her mentor in Multicultural Leadership Orientation (MLO) was an incredible help to her, and inspired her to become a MLO mentor for other students — a role she still fills today. "I fell in love with the MLO content, and I wanted to be a safe haven for new students like the mentors in MLO were for me," Fall said. "The two years that I've been a mentor, it's been so rewarding to invest in students and have them come to me with everything from community concerns to personal questions about choosing courses." 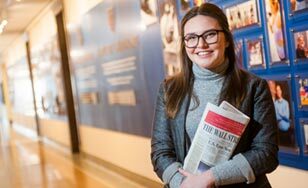 While she has long appreciated the need for activism, Fall's awakening to social justice issues at St. Scholastica ignited a passion for responsible economic development. "There's so much that can be done to communicate with businesses to help them find great places to build and grow, while still providing equal access," Fall said. Fall said many School of Business and Technology faculty, especially professor of economics Tony Barrett, Ph.D. and assistant professor of economics Bob Hoffman, Ph.D. helped empower her in a quest to convert her strong desire for equitability into meaningful work. "All the professors in the business school know us so well," Fall said. "They know what we're passionate about, and they ask specific questions to challenge us individually." This summer, Fall will head to Bend, Ore., to participate in an internship with the city's economic development staff. Fall had a great desire to spend time out West with friends, and with the help of St. Scholastica professors, she was able to locate a city that is serious about inclusive development. "I was able to speak with the economic developer in the city of Bend and told her I have a strong interest in social justice and building environmentally sustainable cities," Fall said. "I asked if they might be interested in hosting me, and they said ‘absolutely.'" Fall hopes to take what she learns over the summer and develop a sense of what it takes to affect real-world change. And she's convinced that without her time at St. Scholastica, she might never have discovered a passion for integrity on an institutional level. Her worldview has been widened; her perspective has been altered. "This is a place where someone from a small town like Ashland, Wisconsin, could experience different cultures on a regular basis, and learn how to do that in a respectful way," Fall said.